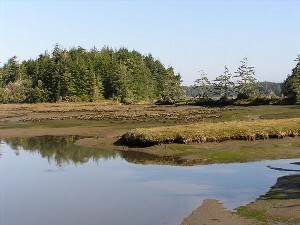 Explore wetlands and estuaries–where fresh water meets salt water! Learn about watersheds and water movement and test water flow in mini-watersheds. With different samples of water, learn about density and salinity, and how along with temperature differences, these properties create water layers and currents. Examine different sediment types and test their properties. Learn about osmosis and how plants and animals meet the challenges of living in changing salinity. Study food webs and investigate adaptations of crabs, worms and clams. Examine the many ways birds are adapted to feed in these rich environments. Test your own hypotheses of the workings of mudflats. There’s a lot more there than mud!